Another month, another surprisingly strong UK wage growth number. At 3.1%, UK average weekly earnings (ex. bonuses) are now the highest in almost a decade, following what has been a particularly strong summer for pay. 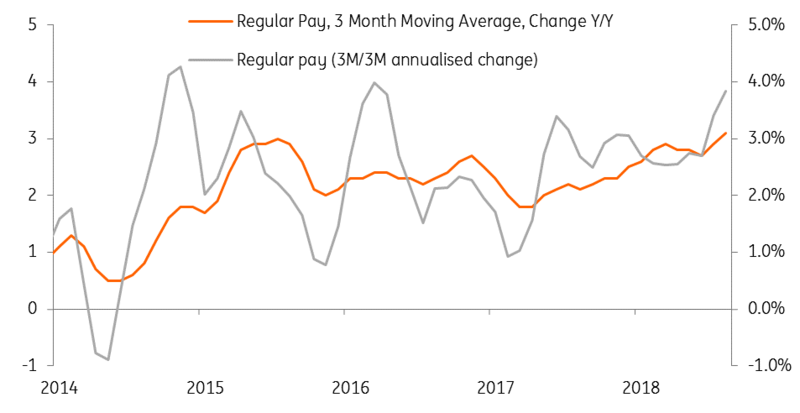 As a measure of just how good the momentum has been, the 3M/3M annualised change in wage growth now stands at 3.8%, noticeably higher than the 2.5-2.7% pace seen through the first half of 2018. This comes as firms report they are increasingly encountering skill shortages, which are forcing them to raise pay more rapidly in a bid to keep/attract talent. Given that wage growth has been central to the Bank of England's rate hike rationale, this trend is likely to keep them on their tightening track. However that is heavily contingent on Brexit, and we think the latest rise in uncertainty could see growth momentum slow once again as we head into the winter. There is some tentative evidence of this in the latest jobs numbers, which unlike wages, have had a decidedly more lacklustre summer. The fact that jobs growth has been more or less flat - and even marginally negative in this latest report - could suggest firms are beginning to take a more widespread wait-and-see approach to hiring decisions. It's probably too early to know for sure, but even if the jobs numbers do hold up, there is still a risk that consumers begin to get more cautious if increased Brexit warnings from businesses see individuals start to reassess their job security. This, coupled with the fact that real incomes are still being squeezed to some extent by the recent petrol price rises, suggests spending could come under further pressure over the winter and overall growth momentum could ease. So despite the better wage growth figures - that might otherwise see the Bank of England accelerate its tightening plans - we don't expect policymakers to raise interest rates until May 2019 at the earliest.